Here is one of the most affordable etools you can buy this or any season. 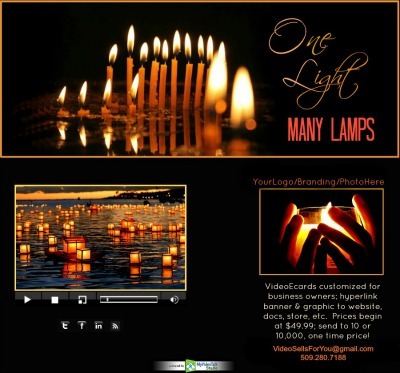 These professionally produced video ecards are not cutey jokes that you may happily send to your family and friends…they are elegant statements, usually drawn from nature, and perfectly orchestrated to beautiful music and sound designs that suit the message. Since this is the Winter Holiday Season, you may choose from video ecards that have appropriate imagery from the current season or cards for those that celebrate religious festivals and high holy days. There’s something for everyone. Prices begin at a mere $49.99 and have gradual prices increases to add e-marketing tools, auto responders, links to your social media, links to your store, attachments like special offers and coupon codes, etc. Launch one of our attractive, entertaining, video ecards and then get on with the other important tasks you have piled up on your desk… LOL we know! Small business owners work twice as many hours than do their larger company counter parts. In larger companies, they’ve grown so that they can hire the help and divide the labour among many hands that make the work light. Those of us running small companies have the task of building it a brick and a board at a time. Those of us who are at least 40 and have been building a small business have had to endure all the changes that have been hurled at us from every digital corner of the universe! Not fun, because we’ve been used to managing our business, handling all the details. With the digital age came the many specialists who manage digital data of all sorts…beginning with our websites and now all the many features that we’re asked to do to keep up and participate in the arena of social media. The reason why these video email marketing devices that I’m offering here, are so effective is that you can have them set up and designed so that they go out to work, and return with reports so that you are able to put yourself back into the driving seat to grow your business. Think of it as managing your customers, your hard won client base, keep your brand, products and services in front of them. If you are not in front of them, you can be sure several of your competitors are. You customers do what you do; they shop and they do that online… during the day, at the office, at home, on the weekend, while they’re on holiday, etc. Stay in front of your clients by not hammering at them with your newest offer or price… that’s called ‘on the nose’ marketing…the best way to approach them is the very same way you like to be approached by someone selling something to you…sideways, co-incidentally, like you send them a entertaining card that just so happens to have your website and social media linked to it, maybe is has a special offer, etc. Point is, they viewed a video that is professionally produced and business ready. THEN they remember you and your service and look around the video card and click on the images. Today’s marketing & advertising is in the social media not the local newspaper or yellow pages. It’s not as necessary as it once was to have a presence in traditional hard copy press and broadcast media of TV and radio. Social media is the place to turn up and you don’t have the time to keep it all up… so it either doesn’t get done, or you hire it done and gamble on the risks that necessitates.